The Aquinas Learning Program is a Catholic, classical, community-based integrated curriculum for homeschooling families from PK - 12th grade. We teach the Catechism of the Catholic Church as a subject, but we also live our Faith by studying the lives of the Saints, weekly virtues, the liturgical calendar, ethics through literature, and reasoning through logic and philosophy to lead students to act based on right reason. The ultimate goal is to fulfill our purpose. God made us to know, love, and serve Him in this life, so that we can be happy with Him for eternity in the next. The classical approach to education is the mode by which culture, tradition, and truths have been transmitted for several generations. The content is based on Philippians 4:6-9, and the approach is based on Aristotle's teachings about how humans learn. It is logocentric because it focuses on the logos as the central unifying idea to which every topic, subject, concept points - He IS Truth! We teach students to BEHOLD, WONDER, CONTEMPLATE and DO. Whether you are using Aquinas Learning at Home independently or at a homeschool center licensed to use the Aquinas Learning Program, we are all connected to the Aquinas Learning Community at large. Since we’re all learning the same material regardless of location or the children’s ages, we can engage in the conversation in unison: asking questions, sharing ideas, sharing experiences, etc. What Does Aquinas Learning Offer? Catholic Core - our Catholic Faith informs all aspects of our program, from teaching ideas, facts, and skills, to living the traditions (Saints of the week, feast days, virtues, service projects, and liturgical calendar). Central is the teaching of Scriptures and the Catechism of the Catholic Church. Thematic 28-week curriculum taught in 3-cycles of content – All students learn the same content in a given year from one of the cycles below. They repeat that cycle 4 years later at a higher level, at an older age. 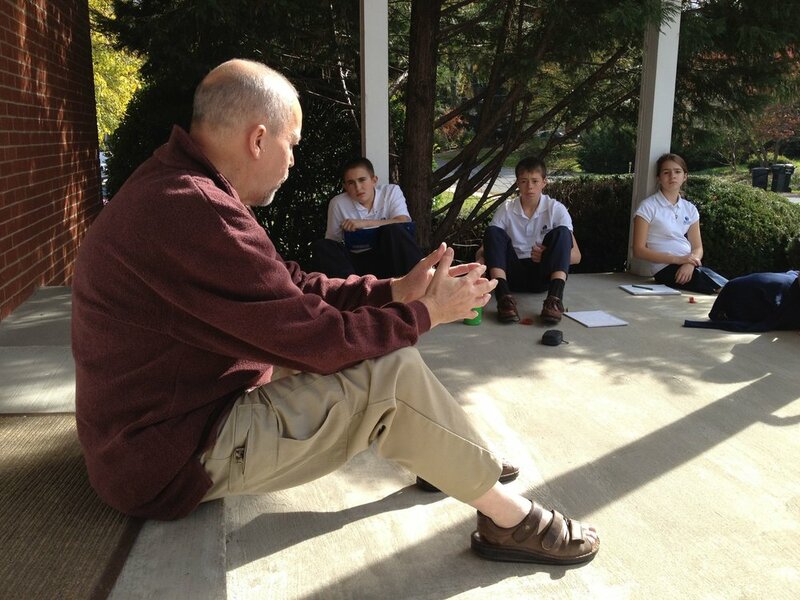 Foundational ideas, information, and skills that marinate them in truth, goodness, and beauty, preparing them for the Schola Alta Aquinas Learning curriculum in middle school and high school. Reinforced Curriculum – Relearning the same material 4 years later, helps to reinforce the curriculum and leads to better retention and a deeper understanding of the materials studied and experienced. Integration – Integrations is woven into the curriculum across the various subjects in order to form a bigger picture rather than a collection of unrelated subjects, which gives more relevance to their studies. Family-friendly experience - everyone in the family is learning the same topics at different levels, which is conducive to shared family discussions, interests, and experiences, such as field trips. Mixed-aged levels – Students can study content from the 3 cycles at one level and restudy the content when they move up to the next level. Both at a center or at home, this also teaches leadership in that older students at a given level (e.g. 3rd grader in Prima I) are encouraged to help mentor younger students in that level (e.g. 1st grader in Prima I).